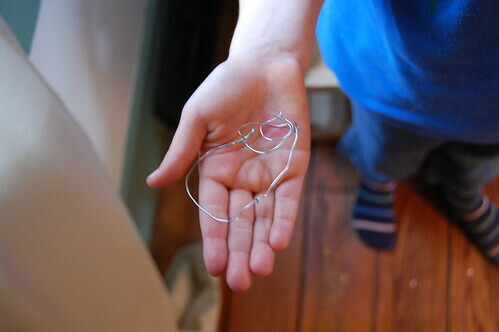 The other day, while I was making dinner, I handed Emma and Mary each a piece of thin wire. I told them to "sculpt" something while I worked on dinner. Emma immediately embraced the idea, wrapping it around knitting needles, fashioning birds and tree branches; while Mary struggled to make hers look like something. "I can't make anything! I don't know what I'm doing!" I told her that it doesn't have to be anything. It could be shapes, or a design or just bent in a bunch of different directions. And that sometimes nothing, is something. I think it was a good little lesson for her–the middle child who always struggles to keep up with the things her older sister is doing. Who is frustrated when she can't write her letters like Emma, or draw a horse like Emma, or figure out a Math problem, like Emma. With the notion that nothing can be something, she was freed up to create whatever she wanted, and seemed to let go of her limiting expectations. the act of creating is just as enjoyable and important as the outcome. A lot of ooohing and ahhhing over "nothing", from her Mama, also helped. I just started a new series of interviews over at Babycenter, where I'll be interviewing some creative mothers, asking about their craft, how they learned, how they incorporate their children into their creative projects. I'm not sure how many interviews I'll share, but I may be asking a few of you, to take part. My first interview is Fabiola Perez-Sitko of Fig & Me.. Our virtual paths crossed just a few weeks ago, and now three of her beautiful dolls are hiding in my downstairs closet until Christmas morning. They are the girls' special present this year and their other gifts under the tree will be compliments to the dolls. We are keeping things simple and budget-friendly this year. I also wanted to let you know that I am always looking for crafty tutorials or ideas to link to on the babycenter blog. 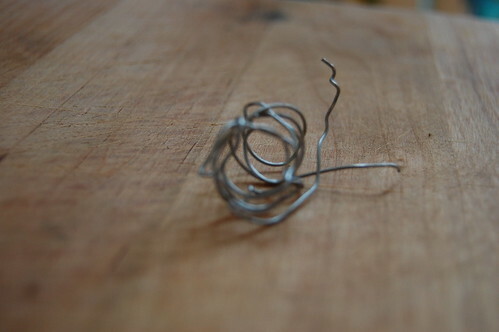 I write a crafty feature each week and highlight lots of crafty finds around the web. If you are doing something that I need to know about, please shoot me an email or leave me a comment on this post. The babycenter blogs get A LOT of traffic, so it's a great way for you to let people know about your blog, as well, if you like. Right now, I'm on the hunt for great holiday crafts, so please send me any and all links and I'll check them out! I have a crafty round-up post scheduled for the end of next week. That doll is just amazing. I’m seeing lots of Waldorf Dolls around blogland and just love them. I’d love to do a course on making them one day, or maybe just having a small someone to buy one for would be enough! I love it! What a great idea to keep little hands busy. Love it! We’ll be using it first thing in the morning, while I furiously try to finish sewing projects. I think that the desire to have a creation look like “something” is my kids’ biggest hindrance in their creative process. I have trouble getting them to just walk the creative path without a destination in mind. And now I have to go look in the mirror. Because I’m the same way. Boo. That doll is so so cute. I want one for me. I love your ‘nothing can be something’ idea. Kids’ creativity can be so limitless when they catch on to the concept of abstract work. That’s exactly what we are doing this christmas. I still need to make the dolls, have the supplies and have no idea what i’m doing so they could turn out ‘interesting’ :). Jessicah – there’s some good books on the market (Making Waldorf Dolls is one, but there’s also a couple of very good Japanese books) and also some online tutorials, plus a few groups around. I love that idea with the wire. Not only are you buying yourself some time to do what needs to be done, you are cultivating your children’s creativity. Very clever. I have lots of ideas on my blog! Great creative lesson! Wow, that doll is adorable! I just found your blog (via Doobleh-vay)…yay!